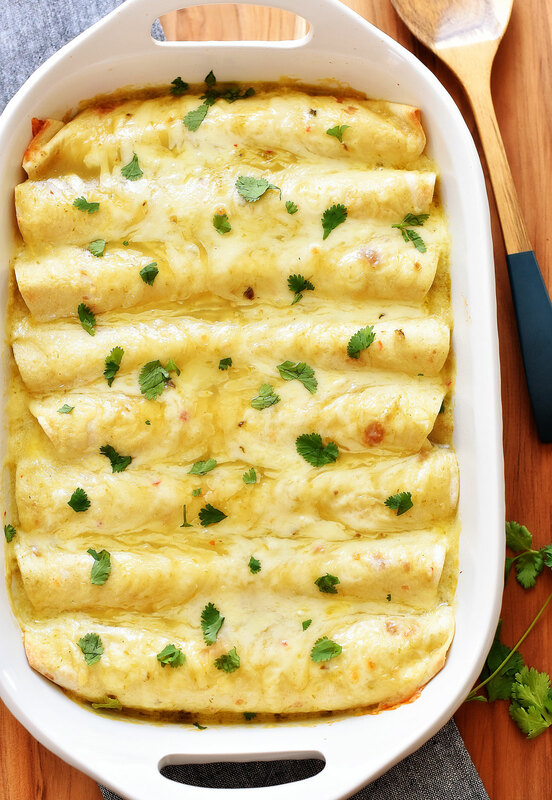 Green Chile and Pepper Jack Cheese Chicken Enchiladas are savory and delicious! They’re loaded with green chile enchilada sauce, sour cream and freshly grated Pepper Jack cheese. 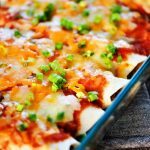 These enchiladas are incredible! 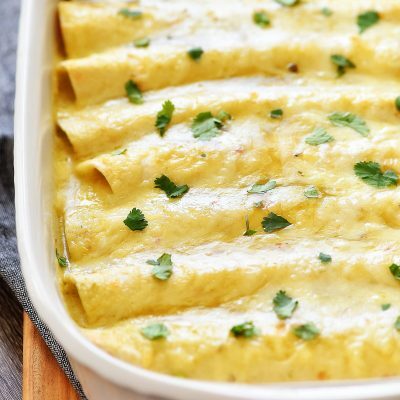 There is just something so incredible about an enchilada. They’re kind of gooey, soft, cheesy, melty.. they’re just delicious! 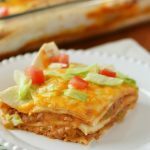 I love beef enchiladas, cheese enchiladas, and I ADORE these Green Chile and Pepper Jack Cheese Chicken Enchiladas! 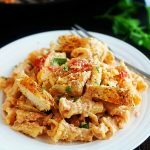 They have wow factor written all over them and they are so easy to whip up. 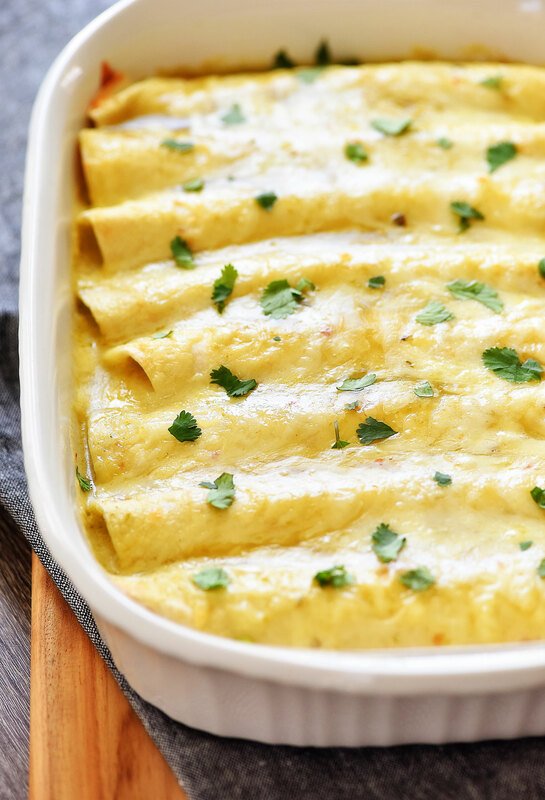 These delicious enchiladas have just the right ‘kick’ for adults. I’m personally a baby when it comes to spicy food and I don’t consider these spicy at all. My kids do though, so if you are making these for your family including the kiddos, I would only use half a can of the green chilies and also maybe half pepper jack cheese and half Monterey jack. Also, you could swap out the chicken for a pound of cooked ground beef or turkey. I can only image how delicious those versions would be! This recipe calls for pre-cooked chicken. I like to put my chicken breasts in a small crock pot with ½ cup water. Cover with lid and cook on low heat 3 to 4 hours. Once fully cooked, shred with two forks. A rotisserie chicken would also work great in this recipe! Preheat oven to 350 degrees F. Spray a 9x13 inch baking dish with cooking spray. Set aside. Place shredded chicken in a medium bowl. Season with salt and pepper. Pour in ½ cup enchilada sauce, diced green chilies, sour cream and cumin. Stir to combine. Divide chicken mixture evenly among the flour tortillas. This should be enough filling for 8 enchiladas. Roll up and place seam-side down in prepared baking dish. Pour the remaining enchilada sauce over the tops of enchiladas. (I only use about 1 can. If you like yours more saucy use both cans). Cover the tops with the shredded Pepper Jack cheese. Bake for 30 minutes or until cheese is melted and bubbling. Remove from oven and let cool 5 to 10 minutes before serving. Serve with salsa, sour cream or whatever your favorite toppings are. Enjoy! This is similar to what I make but this looks even better! Yummy.